The teacher in me can’t help but evaluate the toys my kids spend their time playing with. 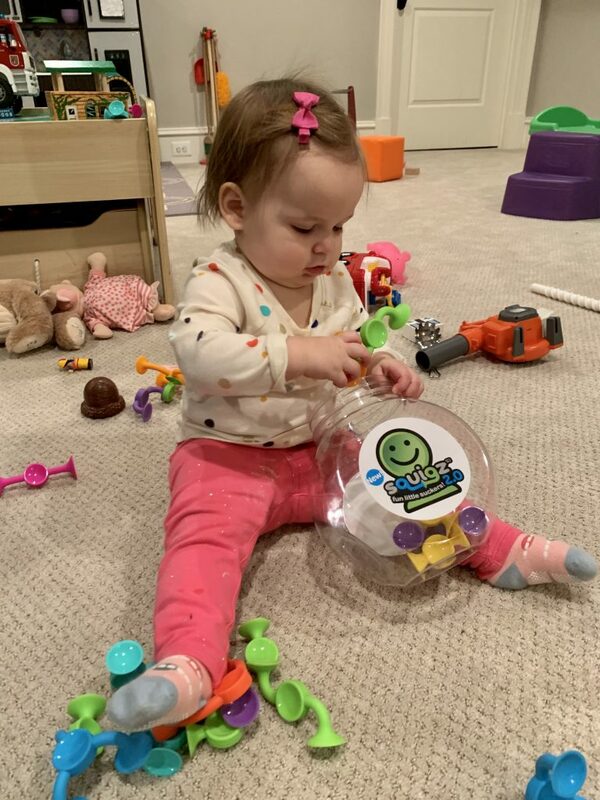 I look for toys that serve multiple purposes such as developing motor skills, promoting social interaction, language development, etc. What are your kids into? Please share in the comments below. Both kids are loving these Squigz. My sister gave them to us for Christmas and they have been such a hit. They are silicone rubber toys that stick together and stick to almost all flat surfaces. These are great for developing fine motor skills — trying to suction them together as well as pull them apart. Grace also loves dumping them out and putting them all back in the tub. Classic 1 year old entertainment! These would be great to bring on vacation as they would stick to airplane/car windows and tray tables. The pieces can also be washed in the dishwasher which is important because they also make excellent teether toys. These Melissa and Doug Slice and Bake Play Cookies are quite the hit in our house! Both kids are loving these for different reasons. 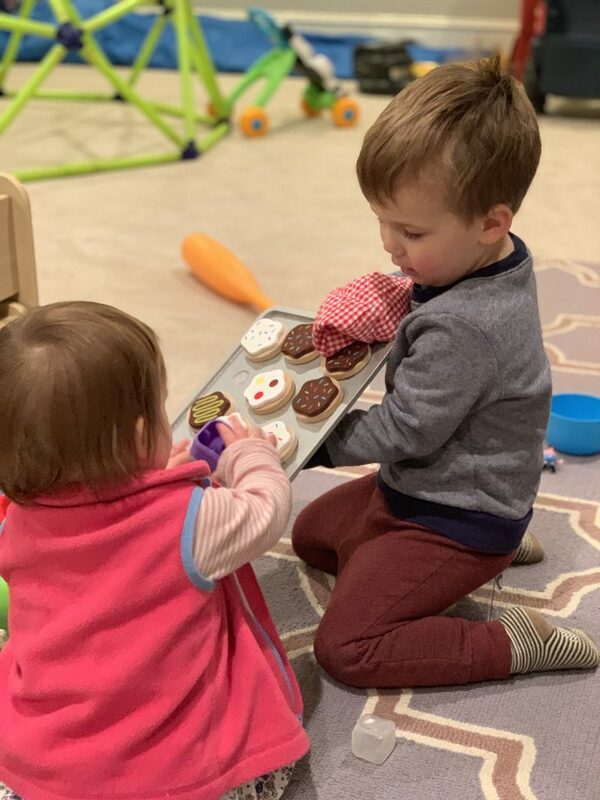 Keener is quickly developing his pretend play skills by putting the cookies in the oven and blowing on them when they are too hot. They also aid in language and social development when he goes around offering them to whomever is present. Would you like a cookie? Do you want the chocolate one or the vanilla with sprinkles? The fine motor component is great as the icing is attached to the cookie and the cookie to the tray with Velcro. He uses both his finger and the spatula to release the cookie which has a tight grasp due to the Velcro. When some of the cookies have been misplaced, we have also explored math by seeing how many cookies we have and how many are missing. Grace loves imitating everything Keener does so she also brings them to people, initiating an interaction and expecting a result. She loves trying to get them off the tray and it leads to opportunities for me to model “help, please” when it’s clear she is needing some assistance. The cookies also come with a tube and she loves putting the cookies in and dumping them right back out! *I am part of the Amazon Affiliate program which means Amazon pays me a small percentage of purchases linked from my site, at no expense to you. I will only share products I truly care about and think you will find helpful.